Spruce Controller and Sensors use 802.15.4 based wireless communication, commonly referred to as ZigBee. The frequency most widely used is the 2.4GHz band which is available worldwide. This is the same band that most WiFi and Bluetooth devices use as well. Range is normally effected and reduced by distance and obstruction. The farther away, the less likely the complete signal will be received. The ZigBee devices have some amount of retry and error correction, but after enough failed connections, the devices will only periodically retry. Try to minimize the number of walls and fences between devices. In many cases a ZigBee range extender will take care of the issue. The Spruce Controller will also act as a range extender for all ZigBee devices. Whichever plug powered ZigBee device is closest to a non-plug in ZigBee device will act as the “router” to get the messages back to the hub. Interference from other wireless devices is harder to detect but can have a large impact on the performance of the devices. Interference will usually come from other Wi-Fi or Bluetooth devices in the vicinity of the hub or controller but can also originate from “noisy” appliances. Noise refers to appliances that emit excessive electromagnetic interference (EMI). Sometimes the solution is as easy as moving the hub a little farther away from a wireless router. Just moving it 1 foot away instead of sitting directly next to other devices is enough to regain the needed range. Other times more in depth investigation is needed and changing the channel on the Wi-Fi router can help drastically. An example of the drastic effect the channel can have was shared by someone in which the Spruce controller was in the same room as the hub and would not join. Upon investigation, the Wi-Fi channel was changed and everything started working immediately without issue. The controller was then moved to the proper location in another part of the house without issue. Schedule says “Water will start in 2 minutes” but never turns on. This is the step when the schedule indicates that the controller should run. Press the “Refresh” button in the Spruce device screen. This is the button that is a circle/arrow found after the zone 16 button. The recently screen should update with 16 responses from the controller indicating the status of each zone. Sometimes exiting to the main SmartThings app screen and then going back to the recently is needed for a full update of the recently tab. If some or none of the zones update, you most likely have a range issue. No Temperature updates for extended periods. This could be normal at night or on overcast days where the outdoor temperature is not changing very much. This is also normal inside the house, which is a very stable temperature. Moving the sensor inside and Temperature reports show up again. This may take up to 2 hour as the device automatically finds and re-joins the network. Move the sensor inside near the hub. The sensor should update within an hour. If you do not see an update, then place the probe in a 3/4 full glass of water and wait for up to an hour. By that time the sensor should have re-joined and updated the reading. Note that if the sensor probe is immediately placed in water but the connection has not been re-established, the sensor will see the new moisture level attempt to send the value but in the process of reconnection, the value may not update in the app. At this point the sensor is not seeing any change in value and will not report again appearing like the moisture is not reporting. The quickest and easiest option is to move the hub away from the router or other wireless devices like computers. Sometimes moving the hub just 1 foot away can resolve intermittent issues. Install a range extender such as the SmartThings Outlet in between the troubled device and the hub or Spruce Controller. Change the Wi-Fi router channel. This is normally a pretty easy task if you are familiar with your router, however many of us have never considered trying to make a change like this. You will need to consult your router documentation to find the current channel and make the change. All of your Wi-Fi devices will change channel to maintain connection without any input from you. This is automatic for all devices. 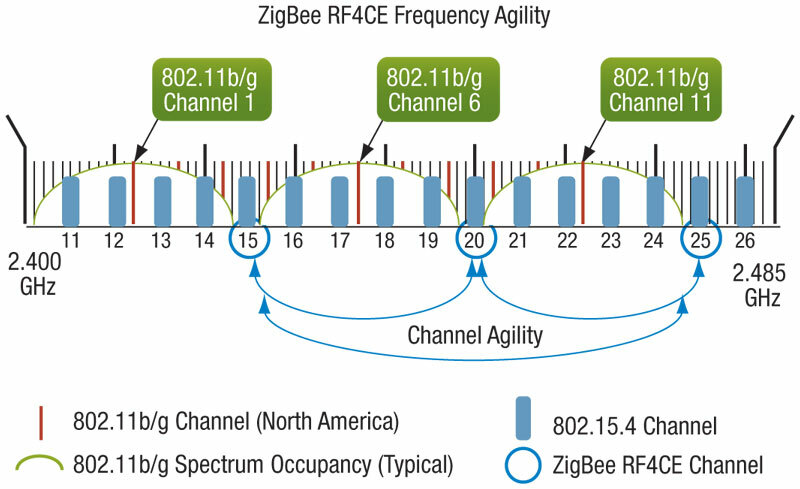 Next compare the Wi-Fi channel to the ZigBee channel in the following picture. 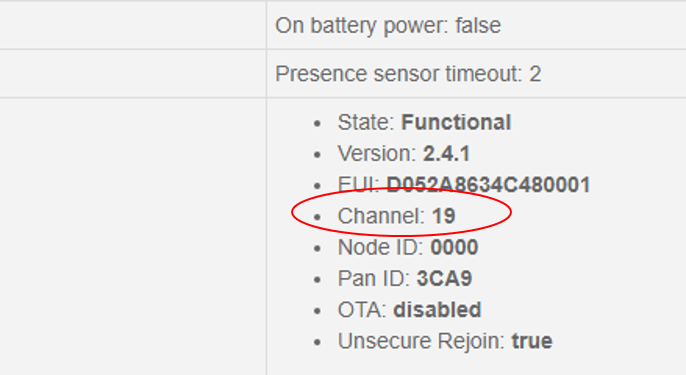 If your ZigBee channel is 19 as shown above, then check that your Wi-Fi channel is 1 or 11. Change it as needed.